Happy Feast of St. Nicholas! 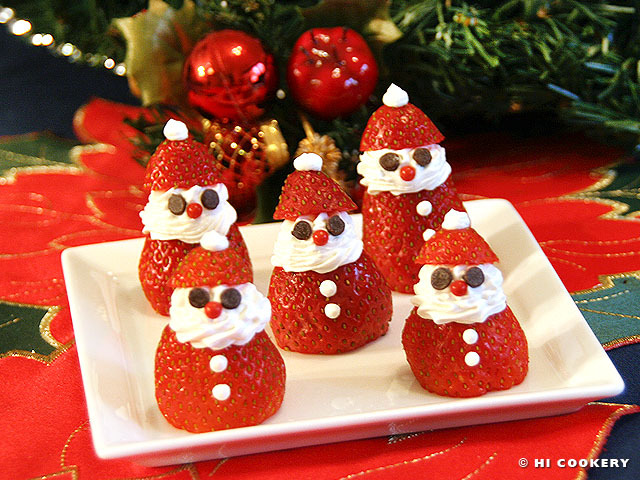 I was excited to receive this submission from HI Cookery earlier this evening, since I had hoped to make these cute little treats, but wasn't able to find decent Strawberries in our area. Aren't they darling! You could easily pipe a cross on the hat/miter or in place of the buttons. You can also use a slice of banana in place of the whip cream for the head/face! for the Feast of St. Nick! and can be made quick! Strawberry Santas are a great last-minute idea for a seasonal snack and creative Christmas cuisine. 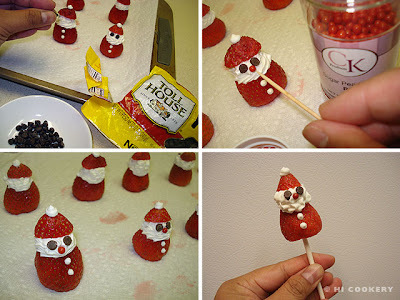 Our friend Lisa L. had sent us an Internet image this past weekend suggesting we try these tiny treats. And then while at Whole Foods Market the other day, we even saw them being sold in the gourmet dessert display case! 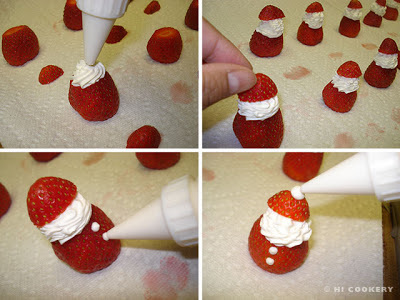 We just couldn’t resist preparing our own Strawberry Santas at home for a ho-ho-ho-holiday blog post and for a fast, fun and festive food on the Feast Day of St. Nicholas. Wash and dry the strawberries. Slice the leaves off and let the strawberry sit on the flat end. Slice a bit off the pointy end of the strawberry. Fill a pastry or plastic bag with whipped cream. Use a star tip to form the head/face. Top with the strawberry piece for the hat. Use a small round tip to pipe the buttons and a little ball on top. Finish the face with eyes by putting in two mini chocolate chips. Add the red pearl nonpareil nose. Arrange on a serving platter and chill in the refrigerator until ready to serve. Regular whipped cream is soft and can melt easily so we recommend a stronger and more stabilized whipped cream product, like the new Cool Whip Frosting, or even sweetened whipped cream cheese. 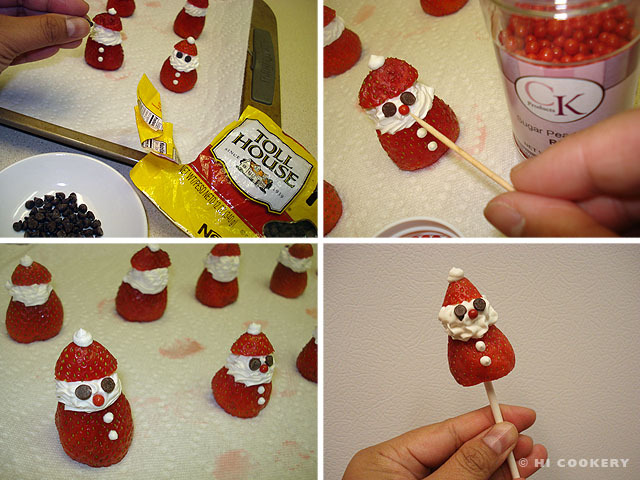 Strawberry Santas can be prepared as pops by putting a stick in the bottom of the fruit. Or they can sit atop cupcakes or cookies as a base. Santa hats can be made out of strawberries, too. 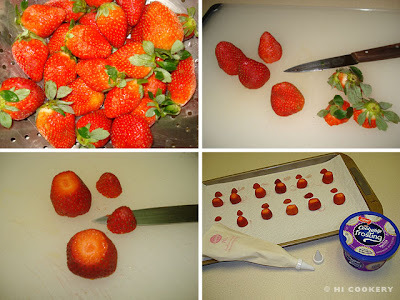 Simply slice the leaves off and pipe whipped cream around the bottom and a ball on the top tip. OH, a friend of mine made something similar that I want to make next year! Hers had a brownie bite on the bottom and it was a St. Nicholas hat. I thought the same thing about making it into a mitre with gold frosting. These are so cute, thanks for sharing! An Our Lady of Guadalupe Festa!